Sweet, tender, flavorful and creamy, Fairy Tale are simply the best eggplants we’ve ever tasted,” says Taylor. This quick-cooking variety is so delicious that it doesn’t even need to be salted. Taylor suggests slicing them lengthwise, then tossing them into stir-fries or sautés, or skewering them on the grill. For most of us, an eggplant is only one thing—the dark purple, pear-shaped vegetable we find in every grocery store produce department. But to the four young founders of Four Root Farm in East Haddam, Connecticut, an eggplant can be oblong or bulbous, firm or creamy, sweet or bitter, and solid or streaked with greens, ecrus, oranges or purples that range from pale mauve to near-black. 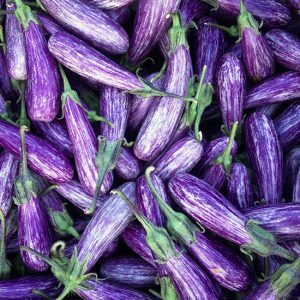 Here, co-owner Aaron Taylor offers a guide to gorgeous and delicious eggplant varieties.